Matt is a Lead UX designer at Verizon Connect in Dublin. 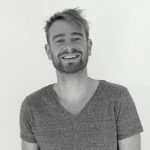 Originally qualified as an industrial designer and mastered in interaction design he has over ten years experience as a UX consultant in the medical, financial, and vehicle tech, industries. He also has extensive experience in branding and visual communications. Matt can work with you to design a new product or help you review something already existing.